Welcome to the Fakequity blog! We blog about racial equity and its nemesis Fakequity. Some of the posts may veer off towards equity’s siblings and cousins diversity, inclusion, culture, community engagement, accountability, etc. They are all related and we need to understand and think about a lot of different things in order to get towards equity. Sometimes we capitalize Fakequity, sometimes we won’t– don’t hate us for our inconsistency. Its a made-up word so the rules around its use are a little loose. Please forgive typos and odd-sounded sentences. The Fakequity team members have full-time jobs and blog on the side, which means we’re writing late at night, in Erin’s case 11.00-2.00 a.m. Some of the posts will be authored by member’s of the Fakequity team, others may be guest posts, and some will be posted under the cover of Fakequity. Some of the posts push the boundaries of comfort and therefore having a name attached to it might not be the best for our professional careers. We aim to talk about what needs to be talked about, but we still need paying jobs and paychecks to buy ourselves tacos and pho. We blog most Fridays, unless it is a holiday, school vacation, a full moon, or something good is on TV. Our Facebook page gets more action, check us out there for more current Fakequity thinking. Settle in, grab a cup of tea, and get to know Fakequity. 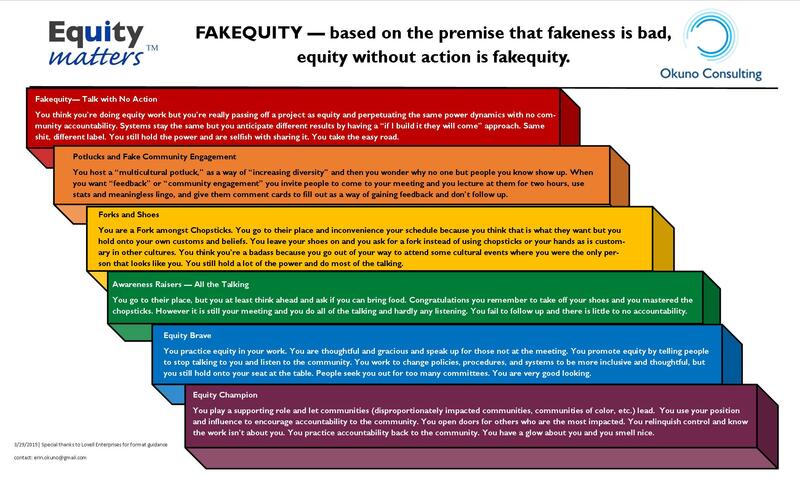 You can start by reading the Fakequity chart above.